Bring your children closer to God in their life by spending time with them doing Christian kid's crafts. There are many specific crafts you can do with your kids to help them see the beauty in their religion. I would suggest crafts that focus on the major tenets of Christianity. Obviously any crafts directly symbolizing the Lord are great, but don't forget the lessons Jesus taught too. Crafts about humility and charity or about individual Bible stories from either Testament can help keep children on a virtuous path. Christian Sunday School is a school for children that is located at a Church which teaches them about the Christian religion, the Bible and how to be closer to God. For this craft, you will need 1 piece of construction paper; picture of child (about 21/2" high) cut from magazine or paper and crayons for drawing child or a printout of a kid, scissors, crayons; picture of your own church if available (such as those printed on front of bulletin) Start the project by folding construction paper in half crosswise and cut up 1" along fold. Fold up and crease the 1" section for each page of folder (sketch b). Print "Let us go" on first section; "into the house of the Lord" on second section (sketch c). Turn folds. 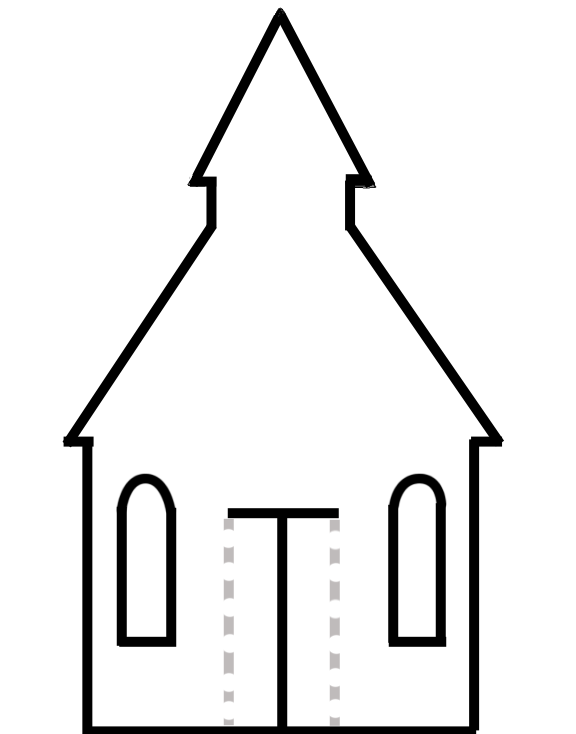 down and trace pattern of church on front section (sketch a), allowing for part that will be turned up later. You may enlarge the church pattern given here or make a pattern that will conform to your own church. 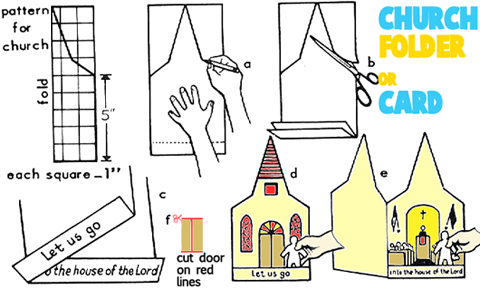 If children are not able to use scissors, cut around top of church outline, leaving about a 4" fold at side. 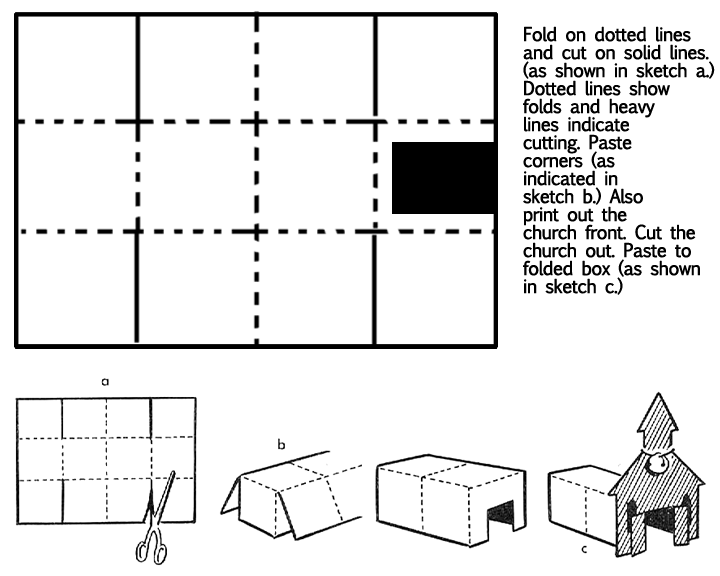 Have child paste picture of church on front of folder or draw a church (sketch d). Then he may open folder and draw the inside of the church (sketch e). 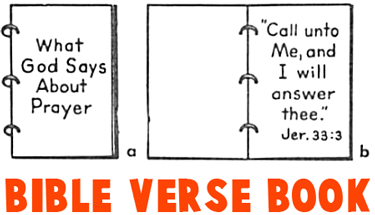 Turn folds up at bottom of each page to show Bible verse. Church will stand up if pages are slightly open. If you want the doors to open, look at (sketch f) to see where to cut the doors - basically in the shape of a capital I. Place paper doll in outside fold. Move doll to inside fold to show him going into church. This is a great craft for Sunday Schools or for kids who you feel are getting spoiled. Get a sheet of paper and in the center of the paper have older children write "Thank You, God, for all the good things You have given me. Amen." 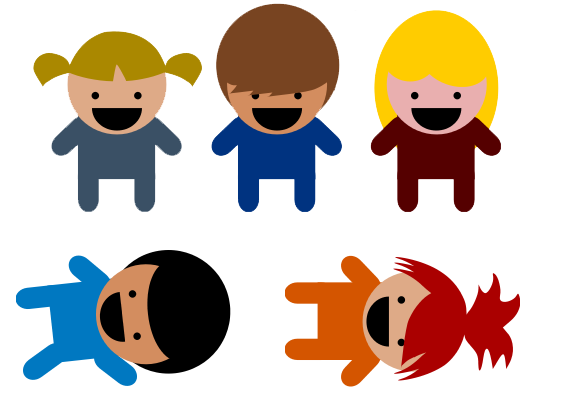 You can write it for younger children, as long as they understand what the project is about. Show these children how much they have to give thanks to. Tell them about all the suffering around the world and how lucky they are to live here. Have child cut out and paste pictures around the edge of the construction paper to form a border...either from magazines or the Internet (or the child can draw the pictures on his or her own) .. The pictures will remind the child of the things for which he should thank God. The parents will most likely want to frame this picture and place it on their child's wall. Here are the materials that you will need for these prayer placemats : 1 piece of cardboard 9" x 12", 1 piece of wallpaper or oilcloth 9" x 12", paste, Thank You Prayer written or typed on small card or slip of paper, scissors, ruler, and scissors. To make this, let the child paste wallpaper or oilcloth to cardboard. 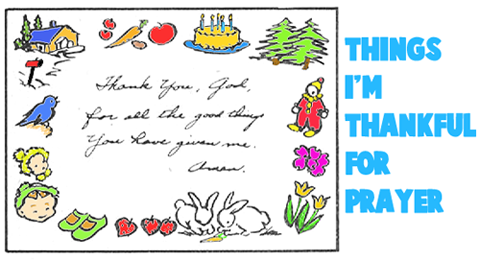 Have him paste the Thank You Prayer (Hear us, dear God, as we say, "Thank You for our food today.") near the top center of his place mat. This will remind parents that the child should say a prayer before each meal. The teacher may trim the edges with pinking shears or scissors. First of all, print out 2 things the front of the church (b&w or color) AND back of church (b&w or color). 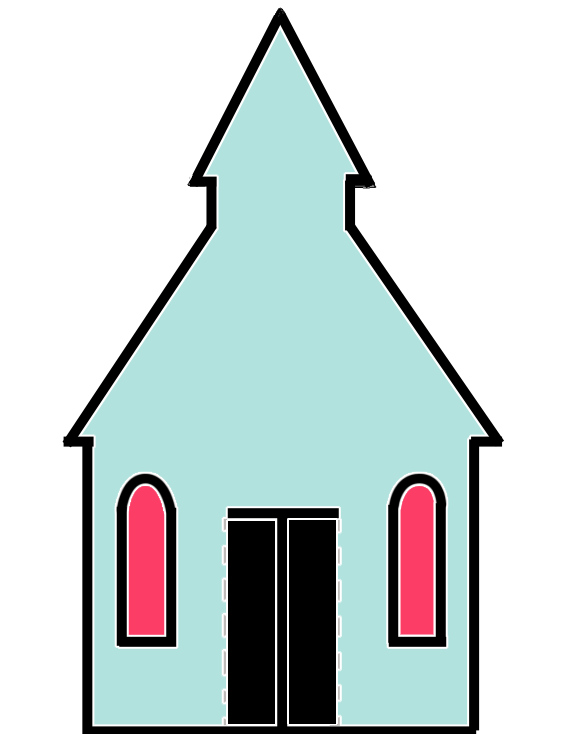 First of all, lets cut out the front of the church....cut on the solid lines and fold on the dotted lines (the doors). Then cut out the back of the church (the box shape). Cut on solid lines and fold on dotted lines, as shown in picture a. Then paste corners as indicated in picture b. Then cut out the black rectangle. Paste the front of the church to the box on the small side that has the rectangle door cut from its side. You now have a paper church. You'll need 12 popsicle sticks, glue, a piece of cardboard, 6" length of yarn for a hanger, Scotch tape, shellac and brush, and macaroni or craft letters. Lay the twelve sticks side by side and fasten with two rows of Scotch tape. Cover one side of cardboard with glue and place ends of yarn on glued surface as shown in sketch b. Put the taped sticks, taped side down, on glued cardboard and place under weights to dry. Choose an appropriate motto and spell it out with macaroni letters or paint it on. 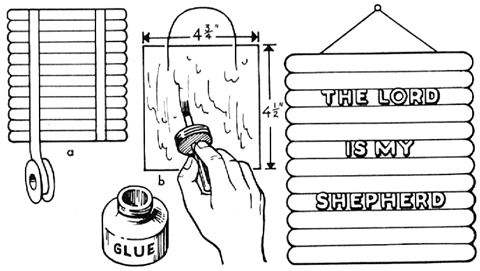 On the picture above, we used "The Lord is My Shepherd". When completed, shellac and allow to dry. Materials Needed are as follows : Five 5" x 5" squares pink construction paper, 1 piece 5" x "5 paper for pattern, 8" of 1/2" wide blue ribbon, 1 paper fastener, pencil and/or pen, scissors, and a paper hole puncher. Firstly, on pattern piece, trace around child's hand and cut it out. Then lay pattern on pink paper and make 5 identical hands. With pen or pencil write the Hands Poem : "Dear Mommy, Happy hands are helping hands, And helping hands are blest. So I will give my little hands To help those I love best, Love, Child's Name". The child's name may be signed. In the heels of the hands punch 1 hole. Tie the ribbon in a bow, slip 1 prong of the fastener through the ribbon and fasten all the hands together with the fastener. Make sure all the hands are facing the same way. On the other 4 hands print the things a child can do at home to help others. Be sure to include "I will obey Mommy and Daddy". You will need two 14"x22" sheets of heavy red or gray poster board (for covers), several 14"x22" pieces of lightweight white poster board (for pages), 3 small binder rings (as in sketch a), paper punch, felt-tip pens or pen and ink. Make the Verses Book by punching three holes along left edge of covers and inside pages so that the holes align perfectly when the pieces are stacked one on top of the other. Insert the three rings as in sketch a. Title the book "What God Says About . ." (the words prayer, witnessing, love, sharing, giving, salvation, etc. may be used). Print one verse about the chosen subject on each piece of white poster board as in sketch b. On the page opposite the verse a picture may be pasted to illustrate the verse or to give a practical application to the verse. To make this craft you will need a pencil, 1 piece of yellow or tan construction paper 9" x 12", 1 piece of green and 1 piece of tan construction paper 9" x 12", crayons, paste, and scissors. 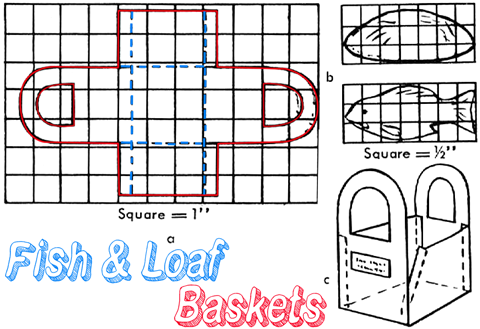 The teacher or parent should enlarge basket pattern (sketch a) and trace on yellow or tan construction paper. Notice that every square in the pattern represents 1 inch, so you can draw a light grid on the paper to help you draw it. 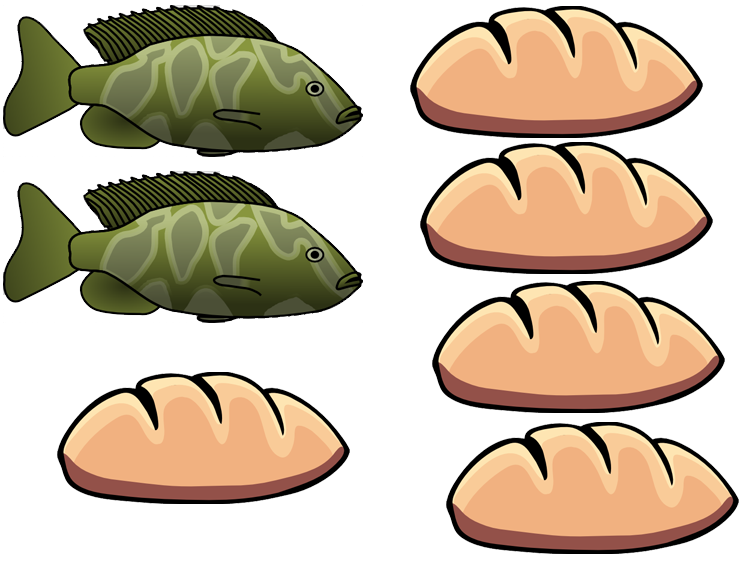 You can print out these fish & loaves or you can also enlarge patterns of fish and loaf (sketch b) and trace fish on green, and loaf on tan construction paper. Give child one basket, two fish and five loaves. Color brown crisscross marks on basket and put eyes and fin marks on fish. Help child paste basket together. Fold four tabs in and fold four sides of basket up. Paste tabs to inside of basket (sketch c). Child may put fish and loaves in completed basket. Sewing 3 Crosses on Window Screens - You get a window screen and different colored yarns and sew a scene with 3 crosses on a hillside.